You are well dressed up, your skin is glowing, your makeup is simply perfect but if your hair does not look healthy or good, you will never look beautiful. It is the way you style up your hair that completes your look. Every one of us takes proper care of our hair and spends a lot of money on hair care products. But the question is “whether you are doing it according to the requirements of your particular hair type?’. Before you start following a hair care routine, it is important to know your hair type first. Until and unless you are aware of your hair type, you simply cannot buy the right products and take care of your hair in the right manner. Wrong hair care products and wrong methods can damage your hair beyond repair rather than making it strong and beautiful. This is why it becomes extremely important for you to have the exact idea about your hair type. You hair will fall into any of the above categories. There are also chances that your hair type can get changed with time. For instance your oil hair can get changes into normal hair. It is not a big deal to identify your hair type. With a simple tissue paper test you can know your hair type at home. It is one of the very simple and effective ways of determining your hair type. In this test you just need a tissue paper that is generally available at home. Before going for this tissue paper test to know your hair type, your hair must be washed with a shampoo one day before. Clean hair and scalp will offer you the right result. To do the test, take a tissue paper and press it lightly at the middle of your head. Also press the tissue paper on the sides behind the ears. Remember to lightly press the tissue paper and do not rub it on the head as it can tear the tissue paper. Take the tissue paper in a well lighted area and have a careful look at it. If the tissue paper looks dry after the test, you have dry hair. On the other hand, if there is some sign of oil in the tissue paper after the test, you have oily hair. You need to extra careful in judging the combination type and normal type hair as these hair types are little bit difficult to identify at the first sign. If your head looks oily and the hair ends are dry every time you wash your hair, then you have a combination hair type. If your hair is non-greasy and looks shiny even after three to four days of washing your hair, then you have normal hair. So, once you know your hair type, it will become easier for you to maintain and take care of your hair in a proper way. Dry hair is brittle and fragile in nature that gives it a dull and lifeless look. 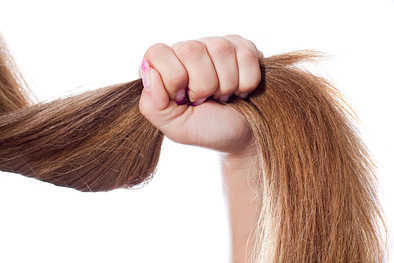 Due to excessive dryness, dry hair mostly has split ends. Dry hair means dry scalp and this often results in itchiness around the scalp. Also dry hair breaks down easily. Dry hair is frizzy and sensitive in nature making it difficult to comb as iteasily gets entangled. Oily hair looks greasy and often has the problem of dandruff and other scalp infections. Oily hair looks fabulous for a day after shampooing but after a day it lacks shine and volume. It looks dirty and unattractive and becomes impossible to manage it properly. Combination hair type has the characteristics of both dry and oily hair. Usually, the scalp and hair roots are oily in nature, while the hair ends are dry. Combination hair often has the problem of split ends due to dry hair ends. Normal hair looks shiny minus the greasy feeling. This type of hair is very easy to manage and looks good even though not washed for a week or more. On normal hair, dye or perm can be used as it will not cause much damage to the hair quality. Note: Your hair type is often linked to your skin type. This means if your skin is oily or dry, your hair will also be of the same nature. For those having dry hair must not shampoo their hair every day. Washing hair with a shampoo twice a week is enough. For washing dry hair, always use a mild shampoo followed by a conditioner having moisturizing ingredients. Hot-oil treatment once in a week is a must for those having dry hair. They can use almond oil or olive oil to massage the scalp to reduce the dryness. For those having oily hair must shampoo daily with a mild shampoo designed for oily hair. This way dirt and grease will not accumulate on the scalp. For oil hair, conditioner is not good. Apply conditioner on oily hair just once a week, with more focus on the ends and not apply it on your oil scalp. For those having oil hair must brush their hair often. Brushing will help in distributing the natural oil on the scalp along the length of your hair. For those having combination hair must follow different ways to treat the scalp and hair ends. They must wash their head often and apply oil and conditioner to the hair ends. Also those having combination hair must trim the hair ends regularly in about six to seven weeks interval to get rid of split ends. Normal hair requires less care and attention as compared to other hair types. Gentle washing with a mild shampoo followed by a conditioner will make your hair stronger, shinier and more beautiful. Regular brushing and oiling are important tips for those having normal hair. Brushing will help in enjoying lustrous hair growth and oil will give shine to your hair. To conclude, it is vital to identify your hair type first and then follow the right hair care routine to make it look beautiful and fabulous. Families in USA buy more medicines per human than any other area. The availability of remedies provided by companies is certainly a contributing matter to prescription medication abuse epidemic. Many patients already know that medications are made to treat soundness problems, but they can injury us if taken incorrectly. Cialis is a well-known generic used to treat failure to get or keep an hard-on. Topics such as “viagra alternative” or “otc viagra” are very popular now. Perhaps you already heard about it. What scientists talk about “viagra alternatives“? Other question we should is “over the counter viagra alternative“. Sometimes men who take street drugs like marijuana find it awkward to get an hard-on and turn to prescription drugs for a temporary solution. Additionally there are various unproven herbal medicines for erectile malfunction.